And We’re Off! 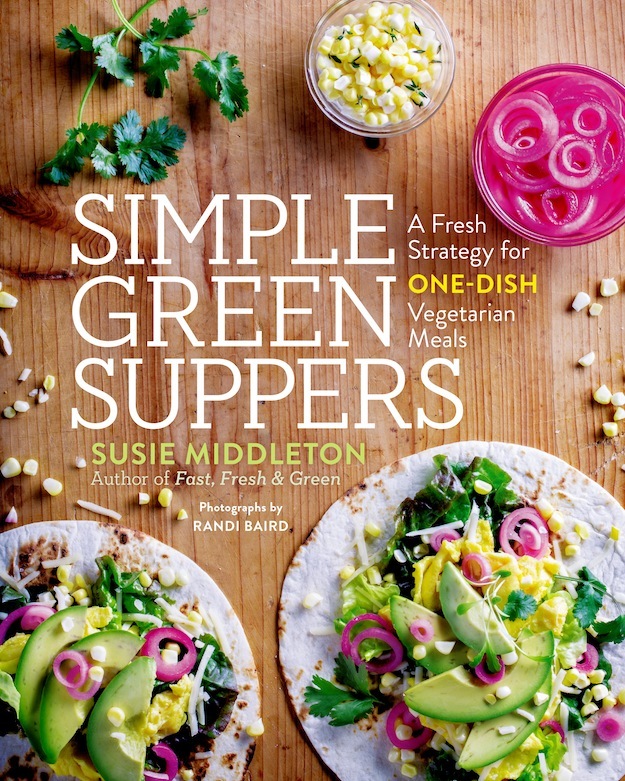 Simple Green Suppers is Live! Just a quick update to let you know that Simple Green Suppers is off and running. We had a really awesome launch party at Morrice Florist. And we’re getting some great buzz! 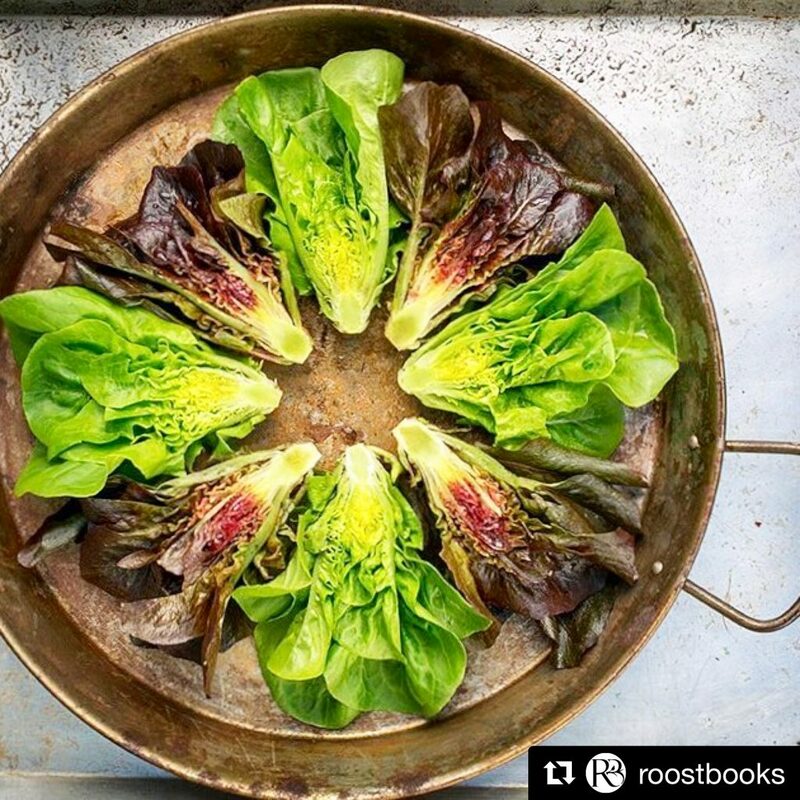 This week I’m guest-hosting the Instagram feed of my publisher @Roostbooks so please follow along to ogle some of @randibairdphoto‘s amazing photos. 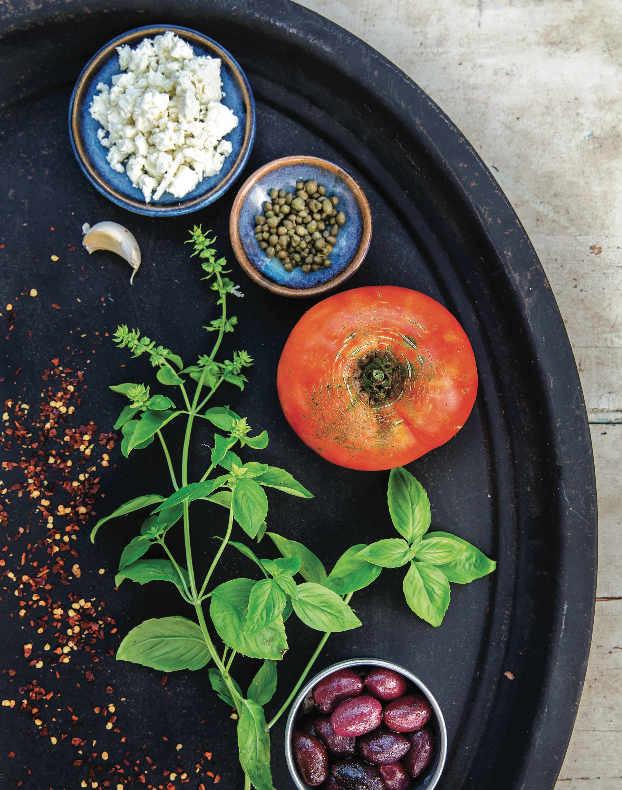 You’ll even get a glimpse at some great photos (like the one above of Little Gem and baby red Romaine lettuce, and the one of cherry tomatoes below) that didn’t make it into the book. (We took a ton of photos.) And while you’re at it, be sure to follow my Instagram feed @sixburnersue. If you’ve gotten the book and are enjoying it already, we’d really appreciate a 5-star (!) review on Amazon! 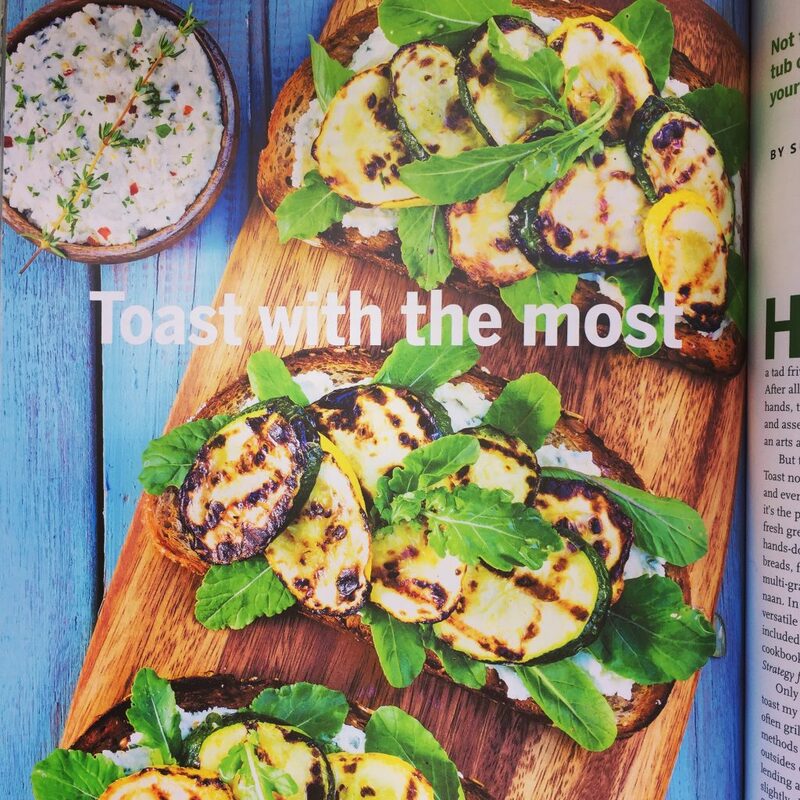 Just published this week–a great feature in Martha’s Vineyard Magazine (photo below) highlighting some of the recipes from the Toast chapter (with my, ahem, opinionated viewpoint on the best way to make toast!). 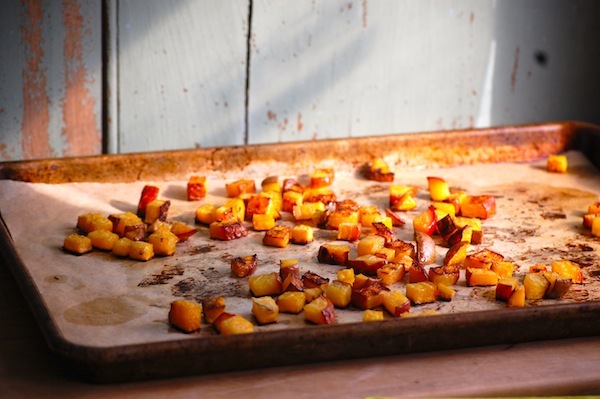 And a feature blog on MindBodyGreen using leftovers from the Baby Potato, Greens, and Chickpea Hash in dishes throughout the week. I’ve been doing some radio interviews and tomorrow I’ll return to my favorite–The Food Schmooze with Faith Middleton on WNPR. Back in my Fine Cooking days, I used to ride up to New Haven every few weeks to be on the show with Faith and Chris Prosperi, and it was so much fun. All photos here by Randi Baird Photography. 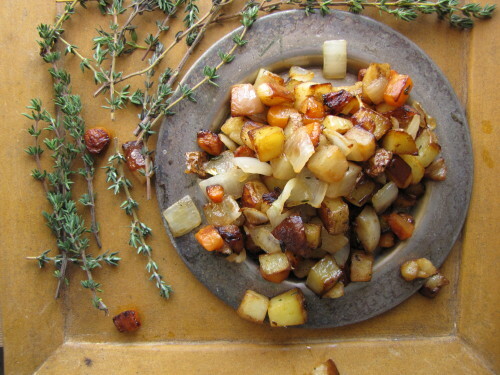 Best Veggie Sides for Thanksgiving, Revisited! Here I go again reposting–so sorry, but once again, no time to create some new recipes for you for Thanksgiving, and time is flying. 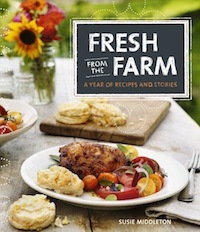 (And, of course, the new book recipes are TOP SECRET…just kidding, I’ll start posting a few of those as pub date nears.) Anyway, I thought you’d appreciate a reminder of some of these amazing veggie side dish recipes on sixburnersue, so here goes. So while, yes, you’ll recognize most on this list, if you’re like me, you may have forgotten some. Reminders aren’t all bad! I hope you all have a wonderful holiday with dear friends and delicious food. Okay, here are our favorites from past Thanksgivings. 2. 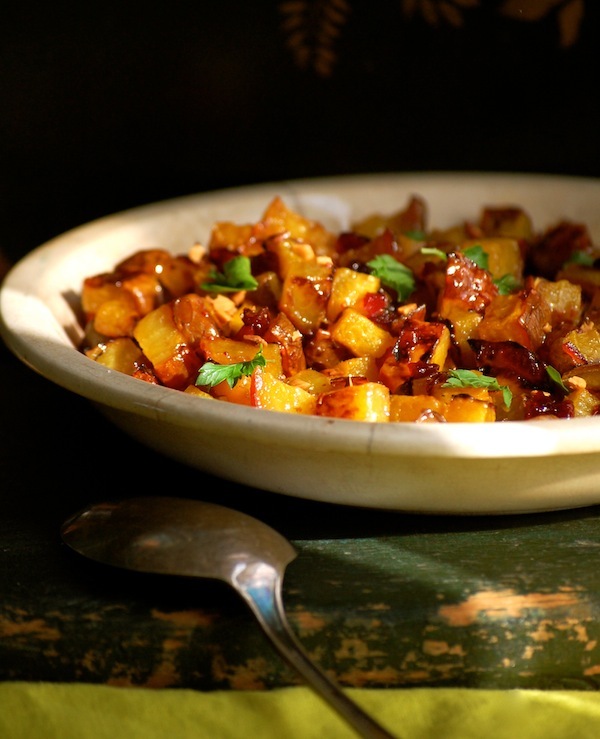 Roasted Butternut Squash with Cranberry-Ginger Butter and Toasted Walnuts. Thursday morning I managed to get out of the house for a coffee date, before it started snowing—again. I detoured on the way home (despite big fat furry flakes already falling from the sky) to go into the “big” grocery store down-Island. I headed for the produce department and went straight for the brightest looking thing I could find, which happened to be orange beets. I still have some Clementines at home, I thought. I’ll make sunshine: Yellow + Orange. My apologies for still being citrus- and color- obsessed. 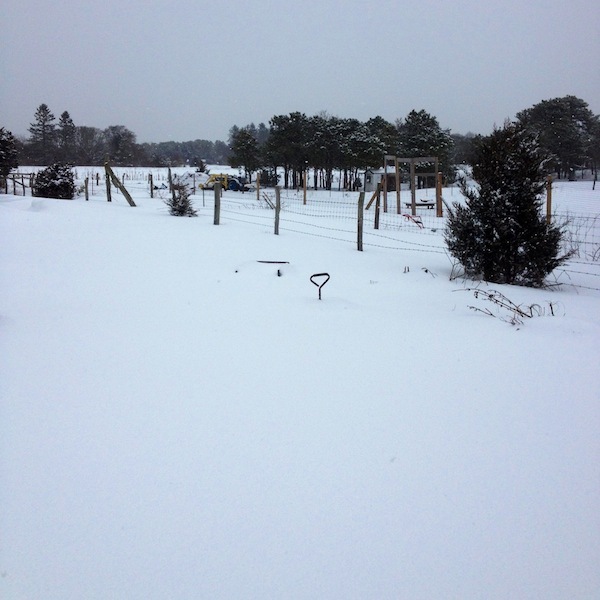 When I first wrote about the snow (specifically, chicken farming in the snow) three weeks ago, I had no idea we had four storms and below-zero windchills just ahead of us. Not that cold isn’t invigorating and grey skies aren’t interesting. In fact the color of the sky is fascinating; one minute it looks like a collection of dull dust bunnies, the next it’s a deep tarnished pewter platter, and then it turns blank, like a nearly colorless piece of cheap copy paper. But sunshine is scarce. And it does get to you after a while. Back at home, I pulled up my Beet Jewel recipe from Fresh from the Farm and decided to tweak a a little variation with golden beets, almonds, Clementine juice and zest, and a touch of vanilla. I zested my clementine and then squeezed a bit of juice out of one half. 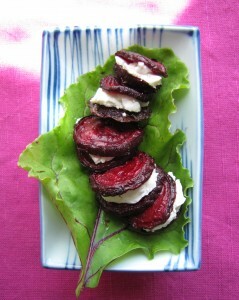 Then I sliced my beets (no peeling necessary) into slices about 1/2-inch thick. I used a piece of brown paper to protect the board from beet stains, but the yellow beets really don’t stain like the red ones do. Then I cut the slices into 1/2-inch cubes, tossed them with oil and salt, and spread them out on parchment-lined sheet pans. I roasted them for about 25 minutes at 450°F, until browned and tender. Then I dressed them with the clementine butter, and took pictures, of course. 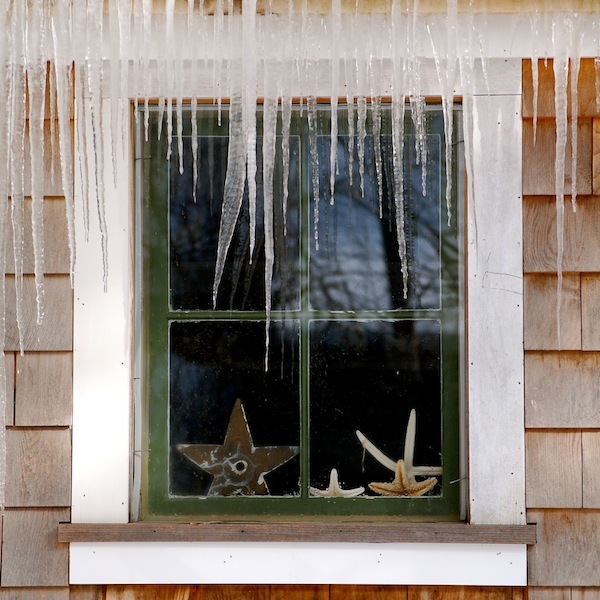 And then I ate my beets, standing up, looking out the kitchen window at the giant icicles dripping off the mudroom gutters, growing longer every day, like Pinocchio’s nose. And I watched for egg customers in the driveway so that I could run eggs out to them (too cold to keep the eggs in the farm stand fridge). It was sort of an egg drive-thru (no French fries or milkshakes, though). Kind of fun, really; but, hey, fun has its limits. Apparently a mix of sleet, snow, freezing rain, and ice is next on the docket. Whatever. You’ll love this method for cooking beets—no peeling necessary, and the small-diced beets cook in only 25 minutes. 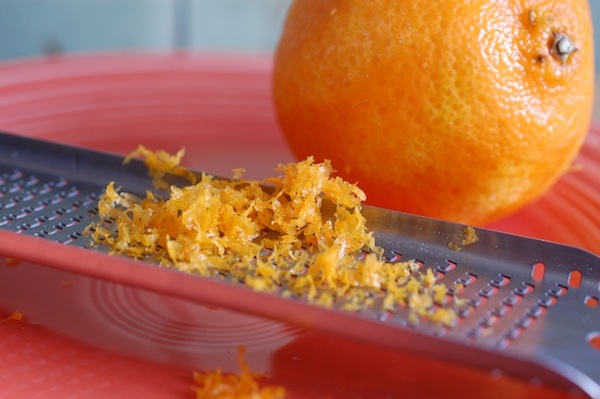 If you don’t have clementines, try a mix of orange and lemon zest and juice. You can also replace the honey with maple syrup, and use whatever nut you like. Heat the oven to 450°F. Cover two heavy-duty sheet pans with parchment paper. 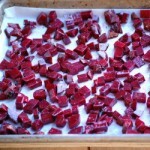 Cut the beets into medium-small dice (no more than about 1⁄2 inch) and toss with the olive oil and 1 teaspoon salt in a bowl. Transfer to the sheet pans, and spread in one layer. Roast until the beets are tender and shrunken, about 25 minutes. (Rotate the baking sheets to opposite racks halfway through cooking for more even cooking.) Transfer to a mixing bowl. Put the clementine juice and zest, the honey, and the balsamic vinegar in a small saucepan over medium-low heat. Stir or whisk until the honey is dissolved and the mixture is hot (it may be steaming but it should not boil), 2 to 3 minutes. Remove the pan from the heat and immediately add the vanilla and the cold butter. Swirl the pan until the butter is melted and the sauce is slightly creamy. Add the cranberries and thyme and stir. 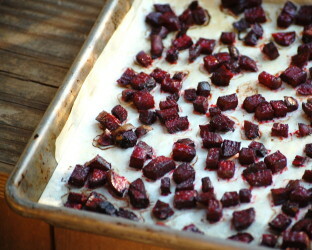 Pour and scrape the butter with the cranberries over the roasted beets and mix and toss gently. Add most of the almonds and stir gently again. Transfer to a serving dish and garnish with the remaining nuts and the parsley. Tomorrow is Christmas. Oh boy. And, in one month, I will hold the first copy of my first-ever hardcover book in my hands. I am doubly excited. This could be a problem, as I’m not known for containing excitement well. So my wise and wonderful publishers at The Taunton Press, who know how excited I am about Fresh from the Farm, have given me permission to publish a recipe from the book, just in time for Christmas. Whew. If you like beets, check out these other recipes on sixburnersue as well. This easy and delicious side dish is a great way to introduce people to roasted beets—or beets in general. 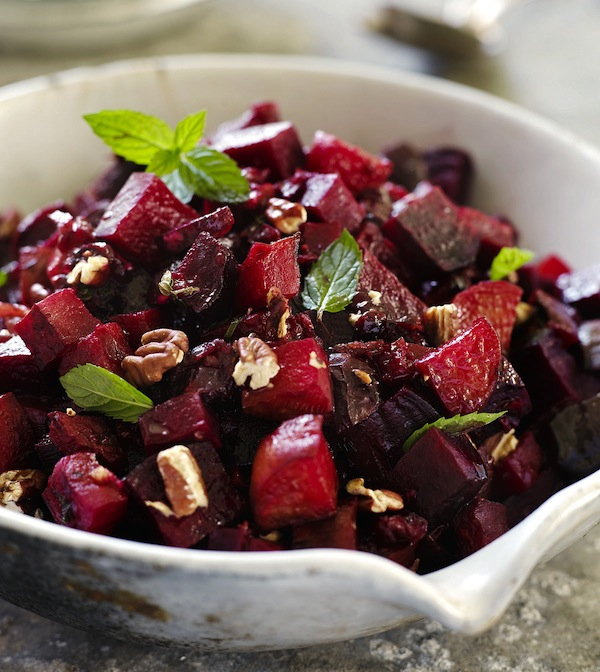 You’ll love it too, because the small-diced beets cook in only 25 minutes—no boiling or long slow roasting here! 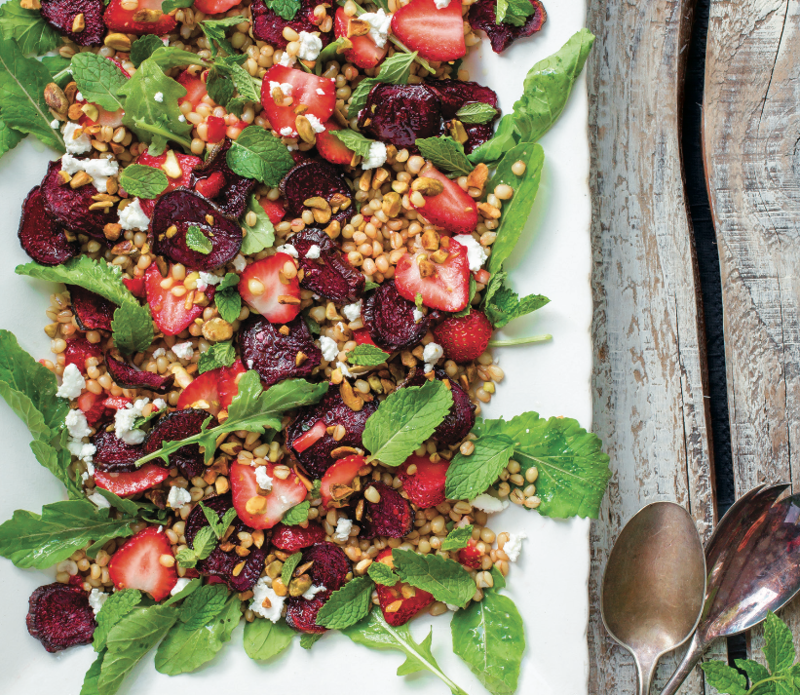 This is just as great to make with summer beets as fall beets, and would be delicious with roast beef, roast chicken or crispy duck. 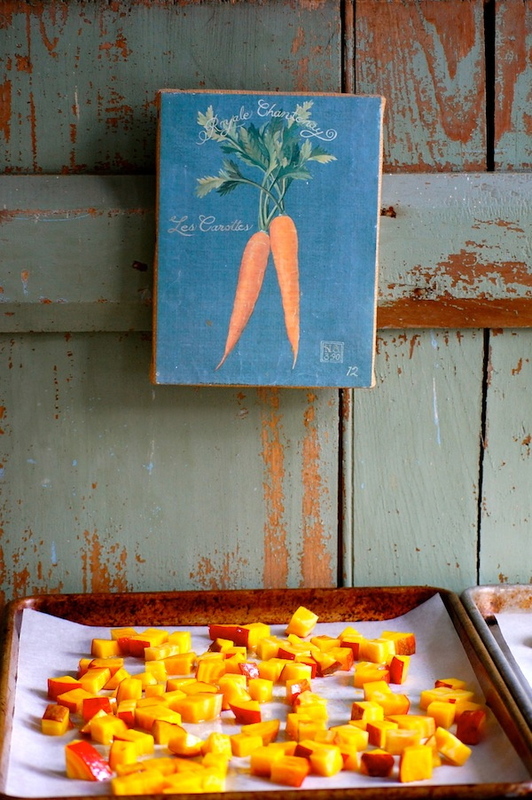 I like to use a mix of red and orange or yellow beets if I’ve got them, but for a variation, you can also make this by substituting carrots for half of the beets. Heat the oven to 450°F. Cover two heavy-duty sheet pans with parchment paper. 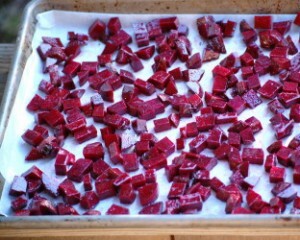 Keeping the red and golden beets separate (if using both colors), cut them into medium-small dice (no more than about 1⁄2 inch). Put each color in a bowl and toss with 2 teaspoons olive oil and 1⁄2 teaspoon kosher salt. 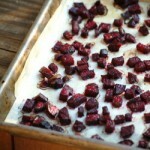 Transfer each bowl of beets to separate sheet pans and spread in one layer. Roast until the beets are tender and shrunken, about 25 minutes. (Rotate the baking sheets to opposite racks halfway through cooking for more even cooking.) Transfer to a mixing bowl. Put the orange juice, raspberry jam, and balsamic vinegar in a small saucepan over medium-low heat. Stir or whisk continuously (don’t walk away!) until the jam is completely melted and the sauce is slightly more viscous (it may be steaming but it should not boil), 2 to 3 minutes. Remove the pan from the heat and immediately add the cold butter. Swirl the pan until the butter is melted and the sauce is slightly creamy. Add the cranberries and thyme and stir. 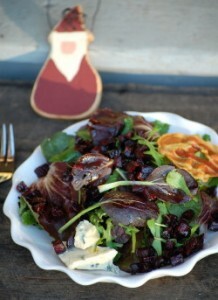 Pour and scrape the balsamic butter with the cranberries over the roasted beets and mix and toss gently. Add most of the pecans and stir gently again. Transfer to a serving bowl and garnish with the remaining nuts and herb leaves (if using). You would think that at some point I’d reach my limit with this whole veggie thing. But it seems I can never get enough. On Saturday I threw Libby and Farmer in the car (this was not hard, as where one goes, so goes the other) and headed off to Whippoorwill Farm. 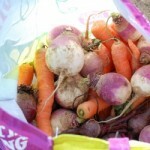 I’d heard a rumor that they were offering their last winter harvest for the CSA to the general public–$20 a share. Oh boy! I remember from belonging to the CSA a few years back that the cabbages and root veggies they provided at the end of the season lasted a good long time in the fridge. 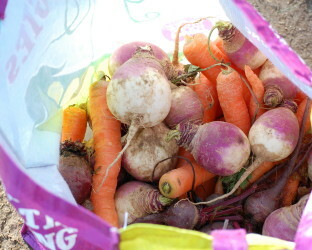 And since the only real winter-keepers we’ve got from our garden are onions and rutabagas, the idea of eating those carrots and beets and leeks (my favorite!) in January and February was too enticing for me to ignore. 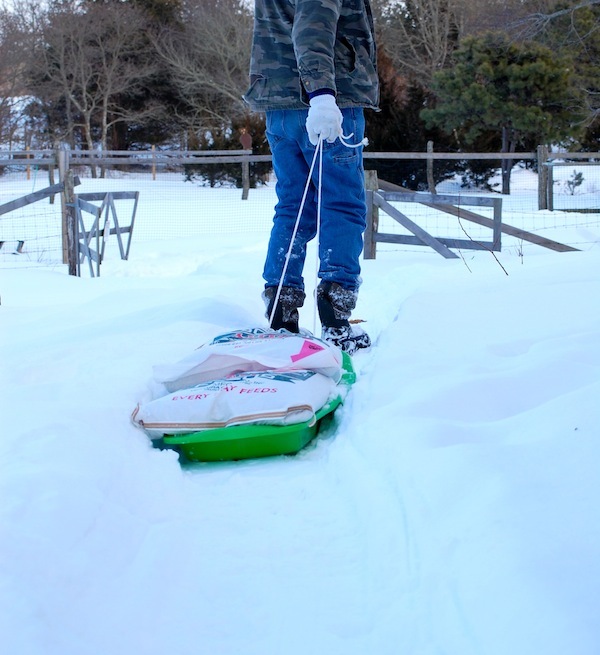 When we got to the farm, Libby took over at the scales, weighing out each pound of carrots, turnips, and beets (we bought a double share, so it was a lot). Then she picked out our bags of lettuce and kale tops while I grabbed the cabbages and leeks. We hadn’t even made it back to the car before we were snacking on the incredibly sweet and crisp carrots. Of course Libby wanted to offer Farmer a carrot, so we broke one into pieces. He had a sniff from his back-seat perch, then proceded to crunch and swallow and lick his lips. Delicious. We ate three more on the way home. But I was so pleased to discover yesterday that the little diced beets did indeed get tender in 20 minutes at 475 degrees. 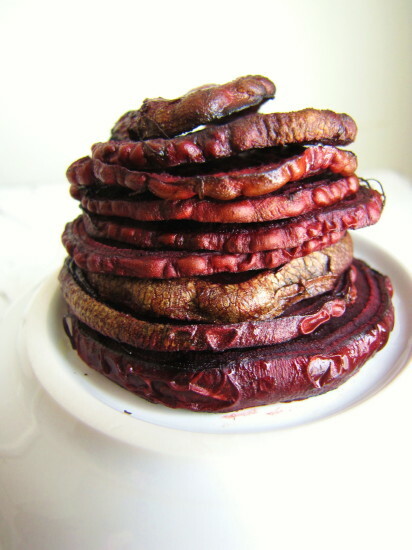 (So the great news is the same here as it is with the quick-roasted slices: You do not need to invest hours of time to enjoy roasted beets.) With caramelized edges, these sweet little gems made a great addition to the salad—which I rounded out with a creamy blue cheese and a bit of salty pancetta. I forgot the nuts this time around, but would have been happy with chopped toasted pecans or hazelnuts. I used a simple white balsamic vinaigrette with a little maple, but you could improvise your own winter salad with your own dressing and any combination of arugula, endive, radicchio, escarole, mustard, tat soi, or other hearty salad green. Figure about two cups loosely packed greens for each serving, and plate the salads for the nicest presentation, especially if you’re including a creamy cheese (which tends to get messy when tossed). Certainly opt out of the pancetta if you like. Follow the simple recipe below to roast the beets. 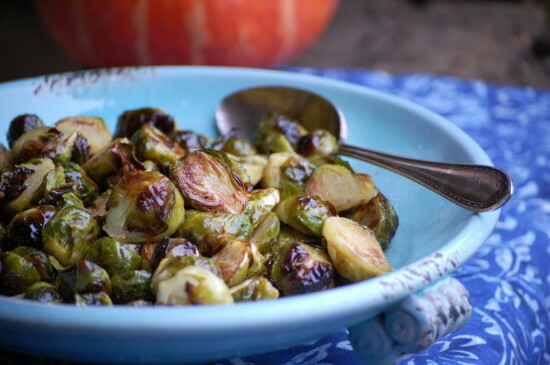 I think using them on the day they’re roasted is nicest (you can leave them at room temp for a couple hours), but they certainly hold in the fridge, too, and can even be marinated in a citrusy vinaigrette to become more of a condiment or relish. I discovered one other thing yesterday—Farmer likes roasted beets and arugula (in addition to Snickerdoodles). I won’t go into the details on how I learned this, but it has something to do with distracting him from the Christmas tree ornaments. 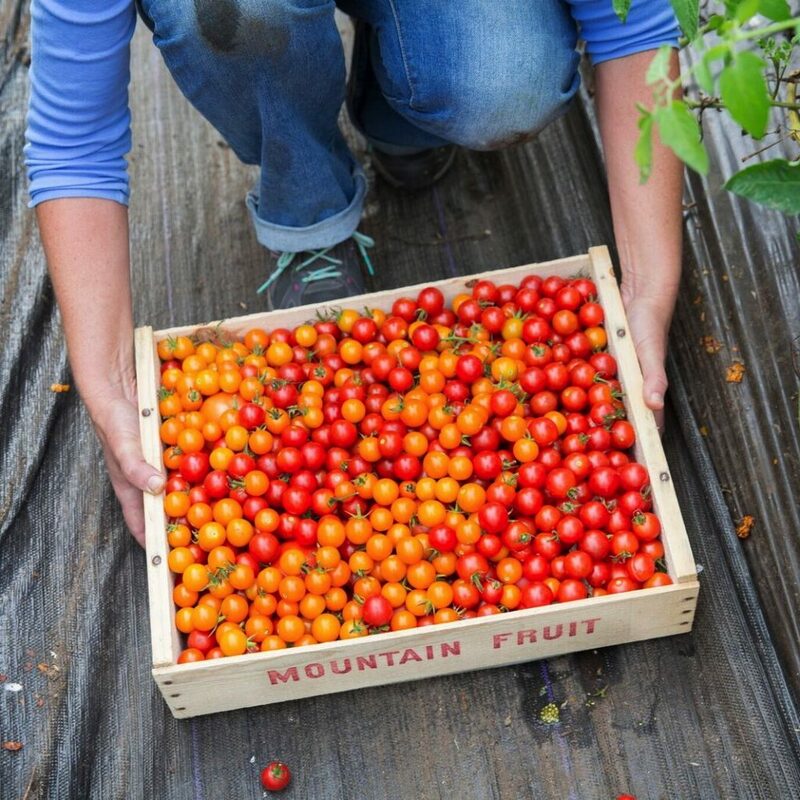 Toss these in salads, marinate them to make a condiment or relish, or just plain eat them as a side dish or a snack. Toss the diced beets thoroughly with the olive oil and salt in a small mixing bowl and spread in one layer on the sheet pan. Roast for 20 to 22 minutes, until caramelized and tender when pierced with a knife (they do not have to be soft, just cooked through. Don’t overcook or they will begin to burn.) Let cool a bit on the sheet pan and eat right away—or later! 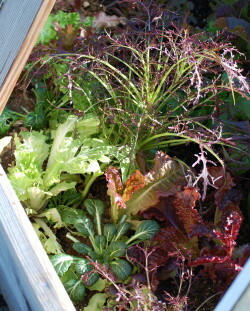 Makes enough to garnish three or four small salads or two large ones. It is well documented that I will roast anything that will stand still long enough. 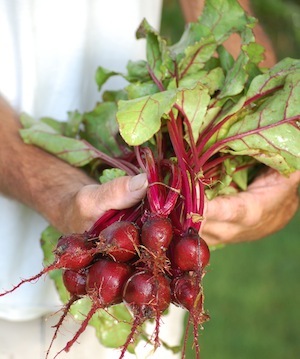 So yesterday, when I accidentally harvested some baby beets while pulling weeds, the beets didn’t stand a chance. I’d barely been home for a minute when I turned the oven on to 450°F. While I’m happy to slow-roast beets at a lower temperature, my very favorite thing to do with them is to slice them thinly and cook them hot and fast. The resulting “chips” are so sweet that I sometimes call them beet candy. I first discovered I could make beet candy when chef George Germon let me concoct a salad for the menu one night at Al Forno restaurant in Providence, RI, where I was a cook. He had some lovely mâche (a delicate leafy green), and I thought beets, goat cheese, and toasted walnuts would complement it. But I didn’t have a lot of time, and the wood-fired ovens at Al Forno are always running super-hot, so I decided to slice the beets really thinly and spread them out on a baking sheet to roast quickly. When they came out of the oven, they were shrivel-y and a bit black around the edges, but incredibly tender and sweet—in that deeply caramelized roasty-toasty kind of way. I’ve loved these quick-roasted beets ever since. So much so that I keep writing about them. Fine Cooking. Fast, Fresh & Green. Now Sixburnersue. You’ll have to forgive me, but here I go again with the recipe—in case you missed it. It’s such a great way to convert beet haters into beet lovers that I don’t want anyone to be without it in beet season. 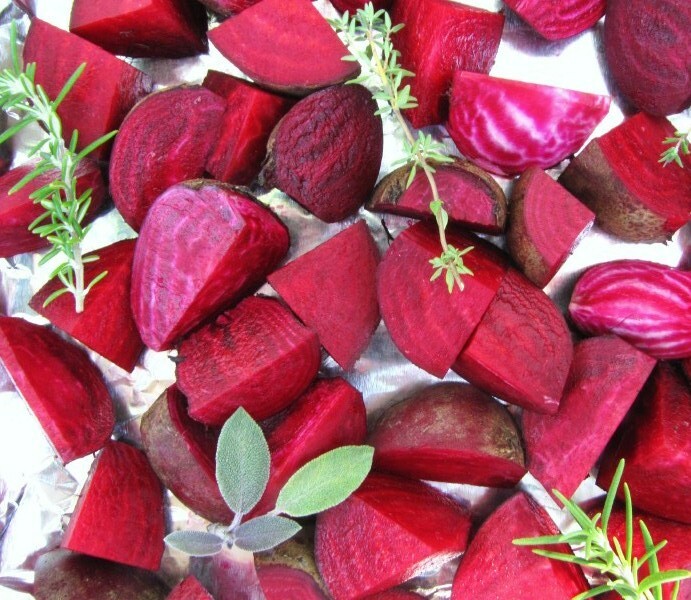 You can gobble quick-roasted beet slices right off the sheet pan. Or toss them into a citrus marinade (after roasting) and tuck them into salads. Sometimes I like to gussy them up by making little beet and goat cheese sandwiches, which I serve as appetizers. I mix some fresh goat cheese with a small amount of chopped fresh herbs or lemon zest, then dollop some on one beet slice, and top that with another. Yeah, a little fussy, but so darn cute. 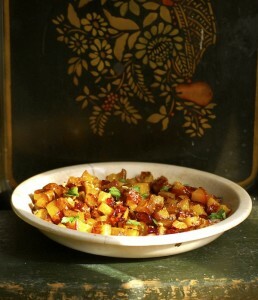 This recipe is adapted from the version in Fast, Fresh & Green. The only slightly tricky part is slicing the beets. Start with a sharp, thin-bladed knife (I love my ceramic knife). 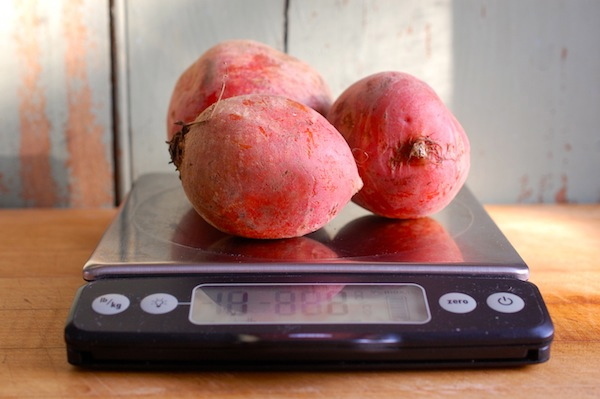 Then, if your beets are too wobbly or unwieldy to hold straight, slice a very small sliver off the bottom and the beet will stay more stable when slicing. 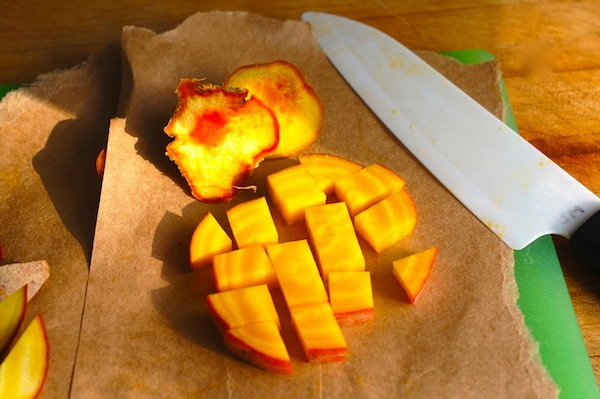 Then just cut round slices that are between 1/8 and ¼-inch thick (3/16 is ideal!). 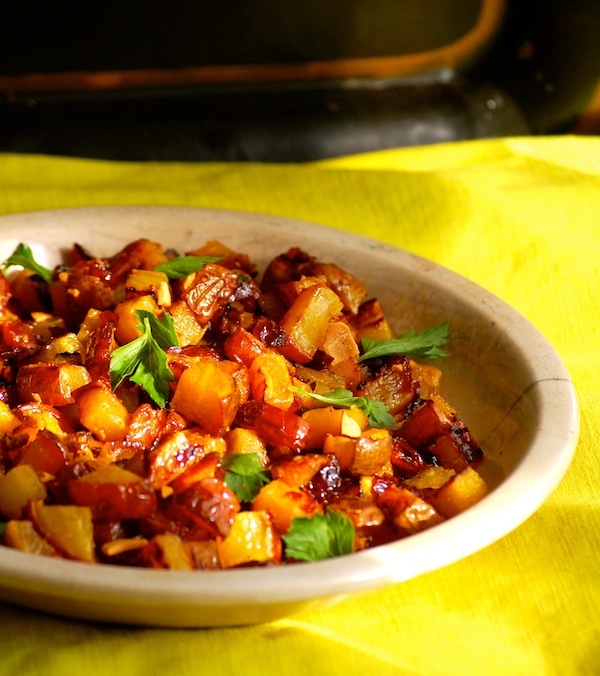 You don’t want paper-thin, or the beets will burn, so there’s no need to get out the mandolin. 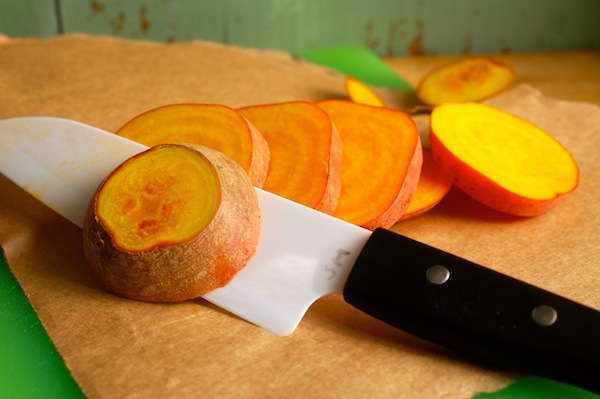 Here’s another tip: to prevent your cutting board from getting stained with beet juice, cover it with a piece of parchment paper or part of a brown paper bag before slicing. Preheat the oven to 450°F. Line a large (18- x 13- x 1-inch) heavy-duty rimmed sheet pan with a piece of parchment paper. 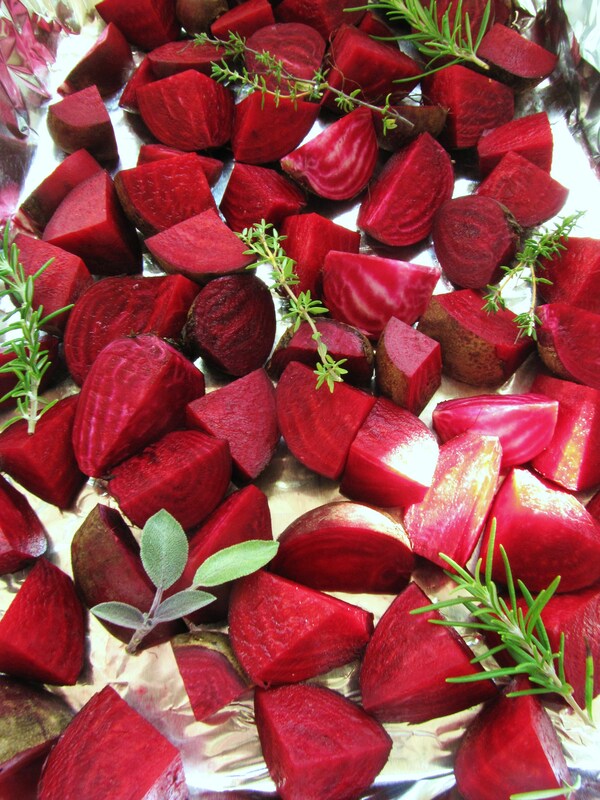 Put the beet slices in a mixing bowl and toss thoroughly with the salt, thyme, and olive oil. Arrange the slices, evenly spaced, on the sheet pan (it’s okay if they touch). 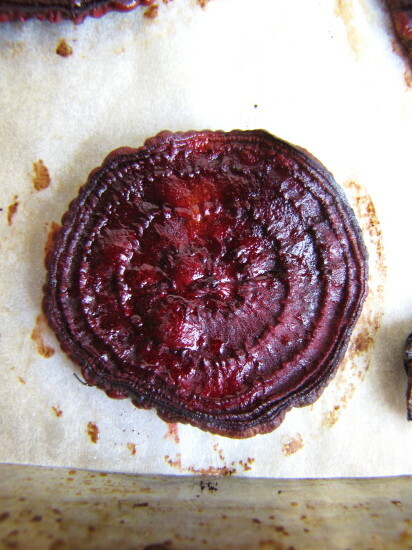 Roast until the beets are tender, shrunken, wrinkled, and glistening, 16 to 18 minutes. 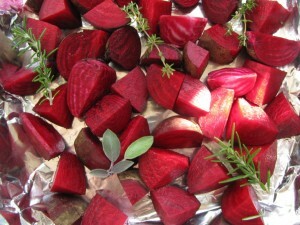 (If your beets are very small, they can roast in as little as 10 to 12 minutes.) The smallest slices will be black around the edges. Let cool for a few minutes and serve warm. Or refrigerate for up to a couple of days. I work at home. Translation: I love a distraction. The kitchen? Definitely the number one destination for diversion. Even on days when recipe developing is not on my to-do list, I like to wander in to my favorite room and concoct a little something every few hours. Something quick, something that might work for our dinner later. Even better, something that might last for a few days. 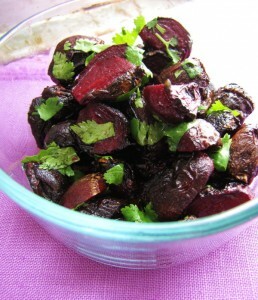 Roasted baby beets (so ruby-red pretty) are the ultimate in quick-to-make, slow-to-cook vegetable condiments. By vegetable condiments (no, I haven’t lost my mind) I mean stuff like caramelized onions and roasted tomatoes—things that are so great to have in the fridge for tossing in salads, onto pizzas, into tacos—that sort of thing. 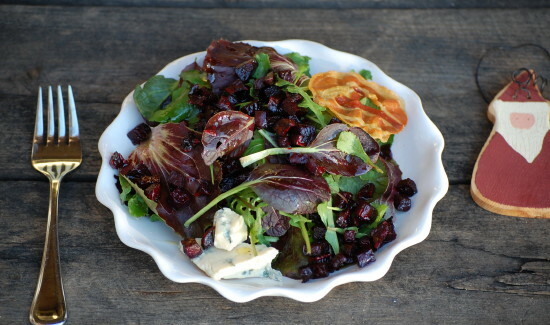 Okay, so maybe roasted beet wedges are not quite as versatile as roasted tomatoes, but they do juicy-up a salad and give you a great excuse to warm up goat cheese or to toast pecans (just add arugula and lemon vinaigrette). 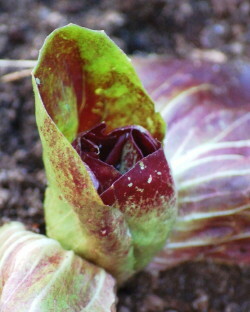 Plus, maybe you’ve got excess CSA-beet syndrome like me. Remarkably, mine (wrapped in a damp cloth and stored in a zip-top bag) have kept for months in the veg drawer of my fridge. But today, icy-blue cold as it is outside, it just seemed like a good opportunity to turn on the oven. 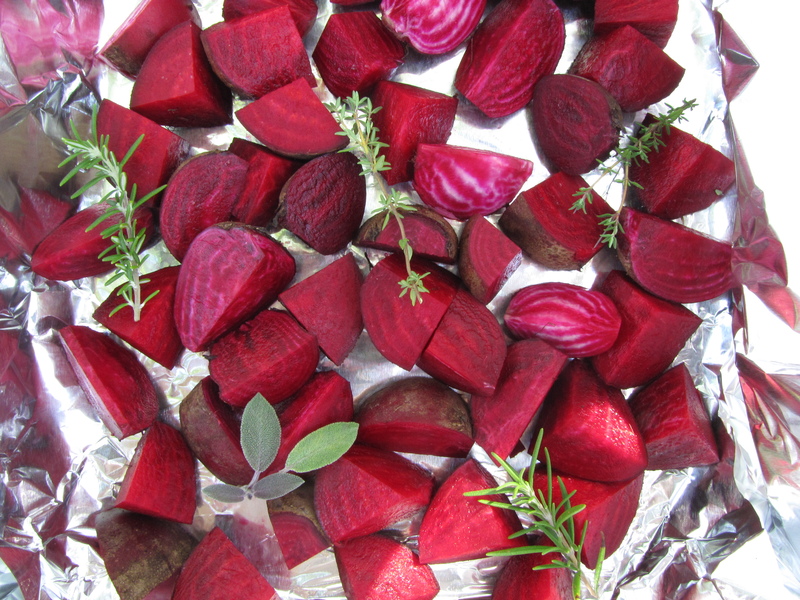 I knew I wouldn’t feel too guilty spending the 10 minutes it takes to quarter a pound of baby beets (no peeling necessary–that skin is perfectly edible when roasted), toss them with a little olive oil and salt, throw in a few herb sprigs, and wrap them up in a tidy little aluminum foil packet. 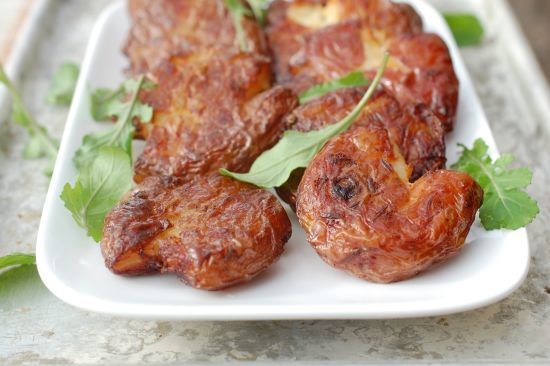 Inside the foil, they steam-roast (getting both tender and caramelized), and you don’t need to do much more than pop one in your mouth after they come out of the oven. There is one extra flavor step you can take. This morning, I let mine cool and then dunked them in a marinade-ish dressing of orange and lemon juices, a little vinegar and maple syrup, and a bit of chopped fresh mint. They’ll loll around in that dressing for days, soaking up flavor in a bowl in the fridge, making themselves coyly available to the nearest taker. Heat the oven to 375 degrees. Line a small roasting pan with aluminum foil, and measure out two other large pieces and arrange them in a “+” inside the pan. 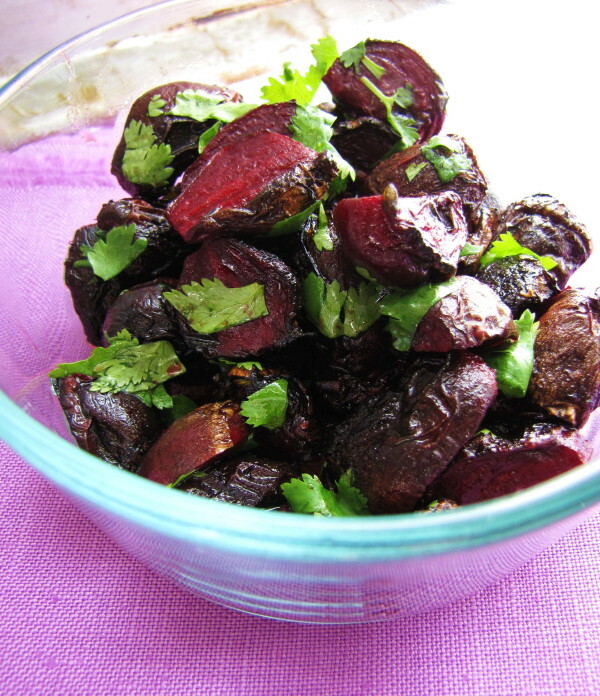 Toss the beet wedges, the olive oil, the salt, and the herb sprigs together in a mixing bowl. Arrange the contents of the mixing bowl in the center of the intersection of the two pieces of foil, and fold the foil up to form a tighly wrapped package. Roast the beets for 1 ½ hours. Carefully avoiding the steam, lift the foil away to peek at the beets and to skewer one or two with the tip of a paring knife. If the knife slides in easily (and the bottoms of the beets are wrinkled and brown), they’re done. If not (and they often need more time), reseal the foil package and continue cooking for 20 to 30 minutes more until tender. Let the beets cool a bit, toss all the marinade ingredients together, combine the marinade and beets, and stow in fridge for future snacks. Or add to your dinner salad of arugula, mache, or mixed greens with toasted nuts.